Students supplied with video lectures came to lessons better prepared than when they had been given textbook readings. Students preferred live in-person lectures to video lectures, but also liked interactive class time more than in-person lectures. Students in the flipped environment scored significantly higher on homework assignments, projects, and tests. There is a need for a scientific research base if Flipped Learning is to be taken seriously by decision-makers in schools, colleges and universities. The failure rate among freshman math students dropped from 44 percent to 13 percent in one year’s time. Accreditation Board for Engineering and Technology. (2009). Criteria for accrediting engineering programs effective for evaluations during the 2010-2011 accreditation cycle. Baltimore, MD. DeGrazia, J.L., Falconer, J.L., Nicodemus, G., & Medlin, W. (2012). Proceedings from ASEE Annual Conference & Exposition 2012: Incorporating screencasts into chemical engineering courses. Toto, R. & Nguyen, H. (2009). Proceedings from Frontiers in Education Conference 2009: Flipping the work design in an industrial engineering course. San Antonio, Texas. There is no single, agreed definition. In higher education institutions, STEM seems to be a convenient way to refer to 4 major academic disciplines – Science, Technology, Engineering and Mathematics. The faculties of Social Science and Medicine are usually regarded as distinct from STEM. From the perspective of government ministries, particularly immigration and labour, STEM refers to professions including scientists, technologists, engineers and mathematicians but also occupations that necessitate some STEM knowledge and/or skills. These days, that means many types of workers including people in social scientific and medical disciplines. From the perspective of educators, the definition of STEM that I favour is “An interdisciplinary approach… that removes the traditional barriers separating the four disciplines… and integrates them into real-world, rigorous and relevant learning experiences” (Vasquez, Sneider & Comer, 2013). Integration is the special characteristic that marks out STEM as distinct from traditional subject teaching. The acronym first appeared in 2001 and is associated with the National Science Foundation in the USA where STEM is perceived as a national priority. The reasons for this go back to the 1950s. The USSR’s launch of Sputnik and early lead in the Space Race precipitated heavy investment and promotion of science and engineering by a panicked America. Since that time, there have been successive top-down interventions from government to promote development of this vital economic sector. For example, in 2011 Congress passed the Race to the Top bill. Gradually, use of the term ‘STEM’ has spread around the world and many other national authorities have instigated top-down STEM initiatives or rebranded prior, similar initiatives as ‘STEM’. To remain globally competitive and to be able to participate in international endeavours. The table below shows % of respondents who agreed with positive statements. With reference to two example developed economies – Japan and the UK – the output of STEM-related research differs considerably. The above table shows that Japan’s researchers produced almost 70,000 papers in one year. The figure for the UK was even higher at 75,914. The latter was achieved with just 200,000 research staff in the UK compared with 650,000 in Japan. Moreover, the citation impact of British research articles was greater. So, it might appear that the UK was more successful. However, Japan’s efforts were much more fruitful in terms of turning research findings into patent applications and eventually into viable products. To me, this shows the complexity of the challenge of promoting a national STEM sector. There are more variables than just getting young people interested in STEM careers and providing quality STEM training opportunities. Currently trending technologies include 3D printing, robots, drones and inexpensive computers like the Raspberry Pi. In future, may we expect to see VR, virtual labs, and the Internet of Things coming to the fore? For instance, a freely downloadable STEM lesson from Young Engineers (www.youngeng.org.uk) requires only cardboard, paperclips, corks, fabric and toilet rolls. In many EFL/ESL/TESOL coursebooks, the approach to reading is usually to proceed from pre-reading strategies of, e.g., content prediction, vocabulary activation, to while-reading sub-skills of skimming and scanning and then to detailed understanding with the occasional inference question and possible post-reading exercises that exploit the text for lexical or grammatical development, or focus on discourse features. For EAP and mainstream secondary/high school readers in open societies, there is a need to go further by developing the skills of reading critically. This is because writers of media articles may seek to persuade the reader to accept a certain explanation of an issue, or a certain moral stance on an issue. Critical readers are not won over by propaganda or marketing-style tactics such as the use of images that evoke sympathy, the misuse of logic, or the inclusion of emotive words. By contrast, critical readers fairly judge the validity and soundness of writers’ claims. Teachers and authors can provide helpful support by setting questions that require identification of these features. Once the skill of identification is mastered through practice, students can progress to setting similar questions for their peers and finally formulating such questions independently for themselves when they encounter other media articles in future. To help authors and teachers, a questioning framework is a useful reference. There are many available, but suggested here are Socratic questioning and Biggs & Sollis SOLO Taxonomy. Below, I provide an example of a reading lesson that begins conventionally but ends with more critical reading by means of Socratic questions. A similar result could be achieved with the SOLO or Bloom’s taxonomies. It is based upon a 2007 article that appeared in the South China Morning Post on the issue of conservation of historic buildings. Cover the text. Describe what you see in the accompanying photograph (with the original article). Can you guess the situation? (clue = date: 10th May 2007) What do you imagine the people are looking at? How are the people feeling? The placards are blank. Can you imagine what was written on them? Have you ever been involved in a protest? If so, can you describe the experience? If not, do you know anyone who has? Would you join this protest? Why/why not? How do you balance heritage conservation with economic development? Now that you know the topic of the article, predict 10 words and phrases that you believe will appear in it. Work in small groups. Use a dictionary and race to complete the table below using 4 of the following words/phrases: dissenting, public hearing, conservationist, public sentiment, plead, antiquities. Who expressed the following opinions? Complete the chart below to summarise the opinions, reasons and possible consequences described by Mr Lam and Ms Lung. Which of the following statements from the article are factual? What belief is behind the words of Ms Man-wah when she says that “The pier witnessed how Hong Kong evolved…”? The term ‘heritage collective memory’ was used by Mr Cheong. What do you understand by this term? Is any evidence reported in the article to support the views expressed? What kind of evidence might support Mr Cheong’s opinions? Do you see any relation between the opinions expressed and the vocations of the people who expressed them? What opinions do you think would be expressed by a prominent business leader, a representative of the Hong Kong Tourism Board, or a traffic police officer? What are the consequences of asserting that the Queen’s Pier is “an inseparable part of the City Hall complex”? Biggs, J.B. & Collis, K.F. (1982) Evaluating the Quality of Learning: Structure of the Observed Learning Outcome Taxonomy. Academic Press Inc. In this article, the Flipped Learning pedagogical approach will be clarified and evaluated for its advantages and limitations according to available empirical evidence and through critical reflection upon its underlying assumptions. The author aims to show that Flipped Learning is neither revolutionary nor a universal remedy for under-performance in study environments. It does not constitute a method or approach but merely a template or framework for arranging work before and during face-to-face lessons. However, Flipped Learning does have several strengths and, in combination with more recently available learning technologies and complimentary approaches, represents one of many legitimate options for well-informed educators. This blog entry then goes on to provide examples of good practice and practical suggestions for educators who opt to experiment with Flipped Learning in their school or university. 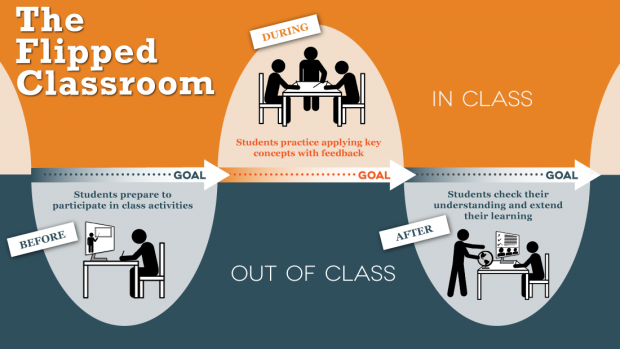 In many descriptions of this approach, a caricature contrast is drawn between the ‘Traditional Classroom’ where the teacher acts as a ‘Sage on the Stage’ and the ‘Flipped Classroom’ where the teacher is a ‘Guide on the Side”. The sage is associated with transmission of knowledge, passive learning and content-coverage, in other words direct instruction. The guide is associated with learner collaboration, active learning and learning by discovery. The guide’s teaching style is underpinned by constructivist learning theory. For such a major role shift to occur, homework tasks, which traditionally have been employed to consolidate knowledge acquired during face-to-face lessons, become the main classroom activity. Conversely, the input of new knowledge, instead of being the major focus of lessons, is designated for pre-class study. However, students are not left to pre-study in isolation without support. For this pre-class phase, the teacher supplies a package of self-study materials to learners, typically short video presentations of key concepts. Students watch these videos at home and complete self-checking quizzes until they believe they comprehend. This means that valuable face-to-face time with the teacher can be devoted to a variety of activities that allow pupils to apply the ideas and extend their knowledge through, for example, case studies, interactive labs, project work or collaborative problem-solving. The teacher is present to monitor, provide guidance and feedback on tasks that activate higher order thinking skills. 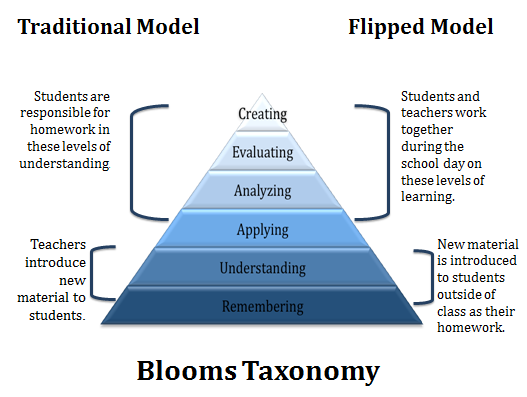 Below are two illustrations of Flipped Learning, the first portraying the process and the second showing how it relates to Bloom’s Taxonomy. Source: Williams, B. (2013). How I flipped my classroom. NNNC Conference, Norfolk, NE. Flipped Learning is thus intended to be a sub-category of blended learning, i.e. partially face-to-face and partially online. With the advent of mobile devices such as tablets and smartphones, learners may complete their pre-class work at a time and location that is convenient for them, and will hopefully begin to adopt a more opportunistic learning habit as a consequence. Perhaps though, Mastery Learning is the true precursor of Flipped Learning. Diagnostic pre-assessment and high quality group-based instruction are also features of this method devised by Bloom (1971). Mastery Learning was researched more rigorously than many other educational methods and results in terms of impact on learning were impressive. However, in the 1970s and 1980s there were practical hurdles to overcome when it came to implementing Mastery Learning. At the time it was criticized for being labour-intensive for teachers and unworkable with large classes of students. The Massachusetts Institute of Technology (MIT) took a revolutionary step in 2001 by opening its huge archive of online lecture recordings to the general public. This spurred interest in free online learning and has led to the development of Massive Open Online Courses (MOOCs) which are accessible through gateway websites such as Udacity, Coursera, edX and FutureLearn. At the time of writing, Flipped Learning remains a popular topic in education. There is particularly strong interest in Flipped Learning in the university sector, where educators are more likely to be required to deliver lengthy lectures and feel a sense of dissatisfaction with the format. Instead of making lectures interactive though, which is a perfectly viable option, they have decided to switch to a method that relegates lectures to homework. 1. Students are able to watch short preparatory video lectures at their own pace and convenience. 1. Video presentations lack the fidelity and subtleties of face-to-face lessons. Also, some learners will not watch the videos before lessons. The traditional lecture format and transmission model of learning are likely to be maintained. 2. Teachers are present when students attempt to apply concepts, and can monitor and intervene as and when necessary to support learners. 2. Teachers are not present when students attempt to understand concepts and they cannot immediately react to students’ misconceptions. 3. Short video lectures can be accompanied by self-checking quizzes. Students can attempt the quizzes as frequently as they wish. 3. If students give incorrect answers to self-checking quizzes, they may not understand why they are wrong. 5. In Flipped Learning, there is a logical progression from the comprehension of concepts and rules to their application. 5. Flipped Learning assumes that learning should be deductive in nature. Sometimes, however, it is valuable for learners to discover concepts and rules by looking for patterns in examples. 6. In order to create video lectures, there are many simple-to-use applications available nowadays. 6. IT skills and facilities vary considerably according to different learning environments. Teachers must ensure that all students have access to the video lectures outside the classroom. 7. In this method, there is a strong emphasis on mastering content knowledge. 7. It is not as convincing that this method could help learners to master procedural knowledge, i.e. skills. *Of course, teachers do not need to limit the type of pre-lesson study materials to video lectures. They could also indicate relevant pages of textbooks or provide links to pertinent websites. The Flipped Learning Network (http://flippedlearning.org/domain/46) claims that adherence to four principles is conducive to the quality of instruction. The author considers these as general principles of good teaching and not specific to Flipped Learning. A more advisable approach would be an eclectic one, utilising methods as and when they are appropriate to the learning situation. There is no need to place Flipped Learning on a pedestal and use it whatever learning situation is encountered. I am going to be so bold as to make an analogy, and I hope it is a close one, between Flipped Learning and a template for writing a cover letter. If I adhered to a recommended cover letter template and were shortlisted for interview, I would not conclude that it was the cover letter template alone that had brought me success. There was also the content, the paragraphing, the skillful use of language, application of accurate and complex grammatical structures, appropriate vocabulary, etc. So, why, in judging the outcomes of Flipped Learning, is it just this “template” that is considered the sole factor. Teaching skills and content, the ability of the instructor to motivate learners, positive interactions with and between learners, these are factors that make the real difference between successful and not-so-successful courses. Flipped Learning is just a template or framework to be used or discarded at the discretion of well-informed and trained teachers. Bergmann, J. & Sams, A. (2012). Flip your classroom: Reach every student in every class every day. International Society for Technology in Education. Bergmann, J. & Sams, A. (2014). Flipped learning: Gateway to student engagement. International Society for Technology in Education. Bloom, B. S. (1971). Mastery learning. In J. H. Block (Ed. ), Mastery learning: Theory and practice (pp. 47–63). New York: Holt, Rinehart and Winston. Bretzmann, J. (2013). Flipping 2.0: Practical strategies for flipping your class. Bretzmann Group LLC. Michaelsen, L. K., Knight, A.B., & Fink, L.D. (2004). Team-based-learning: A transformative use of small groups in college teaching. Stylus Publishing. Task 1: “Space” = classroom layout that is suitable for interactive group work ; “Time” = best use of face-to-face classroom time if concepts have already been learnt before the lesson. iii) Do not worry about creating perfect videos. During the years that I have worked in higher education I have witnessed several passing methodological “bandwagons” onto which educators have jumped, and a little later jumped off (or surreptitiously slipped off ). For example, in recent times Flipped Classroom has become very trendy. A few years ago, there were high hopes for Second Life Virtual Learning. I asked myself why such methods could hold attraction for educators and on what bases they should be selected. One can see the apparent attractions of employing a method for teaching and learning. Both teachers and students should become comfortable with the routines and processes involved. Teachers should feel happy and confident because they know their chosen method was carefully designed to be consistent with à la mode learning theory. Institutions should feel happy because they can advertise their use of modern, scientifically proven, methods. The creators of the methods should be delighted with their influence on the quality of learning (and the royalties from sales of their methodology books). The problem though is that so far no single method that has been proposed is able to suit all learning environments. Particularly with those methods that are based on something, e.g. problems, cases or skills, by adopting one method the educator is immediately restricting options. Here however, with my tongue firmly in my cheek, I make the bold claim that my own method – Learning-based Learning or LBL™ * overcomes this difficulty by encompassing all of the other “Learnings”. LBL is amazing because it eliminates the need to think of the other methods as mutually exclusive, rival solutions. In LBL, teachers are aware of all the above “Learnings” and select elements of them according to their judgment of the needs in particular learning circumstances, and for particular learners. LBL is complemented by another method – Teaching-based Teaching or TBT™ – in which the capability to adopt LBL by untrained teachers, for example the majority of university professors, is enhanced through the requirement that, besides attending workshops about learning and teaching, they also progress through a substantial and rigorous teaching practicum. Thus, the connection between pedagogical theory and practice is strengthened in their minds through the inculcation of career-long reflective practice. Those teachers gradually become more sensitive to what is going on in their classrooms and better able to teach reactively, to teach in response to learning environments that are in constant flux. Armed also with an encyclopedic knowledge of all the methods, they can pick and choose from them in an informed and effective manner. I collected and examined PBL materials from various Subjects/Courses at Temasek Polytechnic for indications of scaffolding, and interviewed facilitators concerning their beliefs about the quality & quantity of learner support that should be purposefully incorporated into the design of the problem materials and/or offered during Stage 2 itself. I strove to understand how the need to assist certain learners in their comprehension of problem scenarios can be balanced with the generally recognized desirability of authenticity in PBL problem crafting. My conclusion was that, although PBL is a form of self-directed learning, scaffolding remains appropriate before and at Stage 2 in the interest of inclusiveness. TP Diploma Courses are sub-divided into Subjects sub-divided into Topics. I was prompted to examine scaffolding in PBL problem materials and at the problem identification stage by two articles, and by a request to develop an academic staff development workshop on the topic of advanced PBL problem design. Hence, I decided to investigate whether such concerns were warranted in the context of PBL in Temasek Polytechnic. In order to make the research task more manageable and to concentrate my thinking on PBL problem design issues, I chose to focus only on the crafting of PBL problems and the facilitation of Stage 2 – problem identification. The latter was included for consideration because I consider that the design of the problem and the facilitation of Stage 2 are inextricably linked. Another significant issue was raised by Greening (1998) who highlighted the “implications of PBL modes for students with a non-English background and from a cultural perspective”, and supplied evidence of the value of scaffolding in this area. About 10% of TP students are non-Singaporean, therefore the researcher considered it relevant for his secondary focus to be the inclusiveness of PBL problem design for international students and for any student with less well-developed English language proficiency. What is scaffolding? In its original sense, it “…consists essentially of the adult ‘controlling’ those elements of the task that are initially beyond the learner’s capacity, thus permitting him to concentrate upon and complete only those elements that are within his range of competence” (Wood, Bruner, and Ross, 1976). As the learner makes progress in gaining mastery of manageable elements, the adult or teacher gradually restores control of the more challenging elements to the learner. The ultimate goal, of course, is independent overall proficiency. The scaffolding metaphor was conceived with one-to-one teaching in mind. It is not immediately obvious how to transfer scaffolding to a classroom situation where the facilitator is outnumbered by the learners, or how scaffolding may be integrated into the learning materials that are used in a class of students. If scaffolding in the sense described above were incorporated into the design of PBL problem scenarios, what form might it take? To digress slightly, let us first consider what ‘elements’ may need to be scaffolded in PBL. They include domain-specific knowledge & skills, and process skills such as time management, interpersonal skills, communication, critical thinking, etc. Besides these, there are other enabling elements that are essential for success in PBL but which may not be mentioned in syllabus documents. Taking control of the vocabulary element leaves learners free to focus on traditional PBL elements such as discriminating between fact and opinion in the text. Then, if there were a second problem on the same topic, learners could go through the same problem identification stage with reduced lexical support, the degree and nature of which is decided by the facilitator in the learning context based on ongoing diagnosis. For instance, fewer lexical items in the problem statement could be hyperlinked to the glossary. In the above example, the facilitator intervenes to remove a potential barrier to problem identification through informed calibration of the language content of a problem statement. In addition, by choosing technique 3 above instead of technique 2, the facilitator is able to maintain the authenticity of language used in the problem statement. This is important for them to enter the discourse community of their chosen profession. It also supports learners during self-directed learning because they may be able to use relevant terminology as search items. As a second example, consider a problem statement in which there is an exophoric reference, i.e. the significance of the reference is not explicit from the text itself, but is obvious to those in a particular situation or culture. For instance, a problem crafter makes reference to consumer behaviour as ‘kiasu’. Singaporeans understand the implications instantly but this is not the case for many international students who have recently arrived in the country. In this situation, the provision of cultural notes could support international students in their comprehension. This technique to provide support can be reduced and withdrawn as the international students become more familiar with Singapore culture, but they need such support in the short-term to give them an equal chance of succeeding in meeting the learning outcomes associated with PBL. Are the above examples of the scaffolding of problem statements characteristic of scaffolding in PBL problem design at TP? multimodal and/or multisensory presentation of information, e.g. memos, live interviews with clients, statistics, etc. There was faithful application of common principles for effective problem design distilled from the work of Savin-Baden and Howell-Major (2004), Dolmans and Snellen-Balendong (1997), and Barrows (1994) and recommended to facilitators by TP academic staff developers. It was difficult for me to judge the authenticity of the contexts, but I accepted the assurances of the facilitators of these problems. As a linguist I was able to see that there was some substitution of language in problem statements; a layperson’s vocabulary was being used when in real life there would be terminology specific to the professions. Learning support was purposefully incorporated into PBL problem design but could not be said to adhere to the original notion of scaffolding because of a lack of dynamism and adaptability in the learning materials. In their training, TP PBL facilitators are made conscious of the need to “Model, support, observe & fade” (Barrows, 1988). It can be argued that scaffolding during problem identification can compensate for the static nature of learner support in problem statements. One might also contest that learners scaffold for each other during Stage 2 because they work in collaborative groups and each have different strengths. Perhaps, for example, in a PBL group there is a learner who has the necessary linguistic ability or cultural insight that the others lack. This learner can scaffold for the others. However, Puntambekar and Hübscher (2005) provide evidence for their opinion that learners are unlikely to be applying principles of instructional scaffolding. If learners struggle with comprehension of the problem statement because of English as a Second Language (ESL) or cultural issues, facilitators have the option either to incorporate scaffolding into PBL problem design or to scaffold comprehension during Stage 2. I suggest that it is inefficient and distracting to deal with ESL and cultural issues at Stage 2 when learners really need to focus on the challenge of identifying facts, and the facilitator needs to focus on the scaffolding of that skill. Moreover, it has become a practical option to incorporate scaffolding into problem design because of the emergence of educational technologies that can reduce the burden on PBL problem crafters in terms of the authoring of dynamic, adaptive problem materials, and diagnostic tests. Scaffolding in problem design may also be more realisable in a PBL setting where students experience the PBL process frequently. There will then be opportunities, to use Bruner’s terminology, for multiple ‘routines’ in the same ‘format’. TP PBL facilitators have designed problems that are true to the principles of PBL problem design sourced from seminal works. There is learner support in the problems that were analysed, but it is not characteristic of the original notion of scaffolding. However, TP PBL facilitators do report scaffolding during Stage 2 of the TP PBL process. To remove barriers to meeting PBL learning outcomes and for more inclusive learning, scaffolding of the assumed elements of language proficiency and cultural awareness is vital, and can be built into the design of problems. Incorporating scaffolding at this stage has the added advantage of making feasible more authentic language use in problem statements which in turn can support learners in their self-directed learning. Do you facilitate Problem-Based Learning or Enquiry-Based Learning? How do you support learners through the process? Is this scaffolding dynamic? Please provide examples from your experience. Thanks! Barrows, H. S. (1988). The Tutorial Process. Springfield, Illinois: Southern IllinoisUniversitySchool of Medicine. Barrows, H. S. (1994). Practice-based Learning. Problem-based learning applied to medical education.Illinois: Southern IllinoisUniversitySchool of Medicine. Dolmans, D.H.J.M. & Snellen-Balendong, H. (1997). Seven Principles of Effective Case Design for a Problem-based Curriculum. Medical Teacher, Sep97, Vol. 19, Issue 3. Hogan, K. (1997) Introduction. In: Hogan, K. and Pressley, M. (eds.) Scaffolding Student Learning: Instructional Approaches & Issues, Cambridge, Massachusetts: Brookline Books, p. 2. Puntambekar, S. and Hübscher, R. (2005). Tools for Scaffolding Students in a Complex Learning Environment: What Have We Gained and What Have We Missed? Educational Psychologist, 40(1), 1 – 12. Savin-Baden, M. and Howell Major, C. (2004). Foundations of Problem-based Learning. Maidenhead, Berks: Open University Press. Vygotsky, L. S. (1978) Mind in society: The development of higher psychological processes. HarvardUniversity Press. Wood, D.J., Bruner, J.S., & Ross, G. (1976) The role of tutoring in problem solving. Journal of Child Psychology and Psychiatry, 17, 89-100.